Air Algerie AH5017 plane, which went missing early Thursday, has supposedly crashed in Mali. 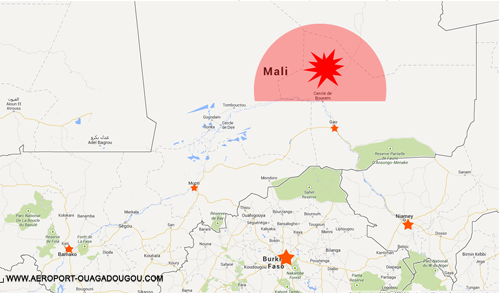 However, BNO News cites UN forces in Mali who claim that no wreckage has been found, and that they will carry on the next morning. Burkina Faso’s Ouagadougou Airport has released a map with the probable area where the plane crashed. Here is the list of the passengers’ nationalities, according to BNOnews. More reports to follow, check back for updates. See an Associated Press report below. ALGIERS, Algeria (AP) — An Air Algerie flight carrying 116 people from Burkina Faso to Algeria’s capital disappeared from radar early Thursday over northern Mali during a rainstorm, officials said. France deployed fighter jets to search for wreckage and the country’s president said the plane most likely crashed. The MD-83 vanished less than an hour after takeoff from Ouagadougou, the capital of Burkina Faso. 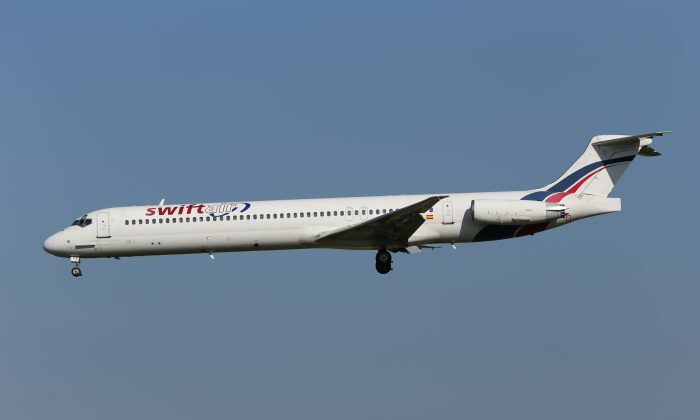 Air Algerie Flight 5017 was operated by Spanish airline Swiftair, which owns the plane. Two French fighter jets are among aircraft scouring the rugged north of Mali for the plane, which was traveling from Burkina Faso’s capital, Ouagadougou, to Algiers, the Algerian capital. Hollande said “all military means we have in Mali” were being activated for the search, through the night if needed. France has considerable military means in Mali, because of its intervention in the country in January 2013 to rout Islamic extremists who were controlling the north. The U.N. peacekeeping mission in Mali, known as MINUSMA, was also helping in the search, U.N. deputy spokesman Farhan Haq said. More than 50 French were onboard the plane along with 27 Burkina Faso nationals and passengers from a dozen other countries. The flight crew was Spanish. Before vanishing, the pilots sent a final message to ask Niger air control to change its route because of heavy rain in the area, Burkina Faso Transport Minister Jean Bertin Ouedraogo said. A resident who lives in a village in Mali about 80 kilometers (60 miles) southeast of the town of Gossi said he saw a plane coming down early Thursday, according to Gen. Gilbert Diendere, heading the crisis committee set up in Burkina Faso. “We think that it is a reliable source because it corresponds to the latest radar images of the plane before it lost contact with air controllers,” Diendere said. Radar images show the plane deviated from its route, Diendere said. Gossi is nearly 200 kilometers (175 miles) southwest of Gao. The vast deserts and mountains of northern Mali have been the scene of unrest by both Tuareg separatists and Islamist radicals. The disappearance of the Air Algerie plane comes after a spate of aviation disasters. Fliers around the globe have been on edge ever since Malaysia Airlines Flight 370 disappeared in March on its way to Beijing. Searchers have yet to find a single piece of wreckage from the jet with 239 people on board. Last week, a Malaysia Airlines flight was shot down by a surface-to-air missile while flying over a war-torn section of Ukraine. The back-to-back disasters involving Boeing 777s flown by the same airline were too much of a coincidence for many fliers. Then this week, U.S. and European airlines started canceling flights to Tel Aviv after a rocket landed near the city’s airport. Finally, on Wednesday, a Taiwanese plane crashed during a storm, killing 48 people. It’s easy to see why fliers are jittery, but air travel is relatively safe. There have been two deaths for every 100 million passengers on commercial flights in the last decade, excluding acts of terrorism. Travelers are much more likely to die driving to the airport than stepping on a plane. There are more than 30,000 motor-vehicle deaths in the U.S. each year, a mortality rate eight times greater than that in planes. Algerian Prime Minister Abdelmalek Sellal said on state television that 10 minutes before disappearing, it was in contact with air traffic controllers in Gao, a city under the control of the Malian government, though it has seen lingering separatist violence. The plane had been missing for hours before the news was made public. It wasn’t immediately clear why airline or government officials didn’t release information earlier. Ouagadougou is in a nearly straight line south of Algiers, passing over Mali. Swiftair, a private Spanish airline, said the plane was carrying 110 passengers and six crew, and left Burkina Faso for Algiers at 0117 GMT Thursday (9:17 p.m. EDT Wednesday), but had not arrived at the scheduled time of 0510 GMT (1:10 a.m. EDT Thursday). Swiftair said it has not been possible to make contact with the plane and was trying to ascertain what had happened. It said the crew included two pilots and four flight attendants. Later, Swiftair said the plane was built in 1996 and has two Pratt & Whitney JT8D-219 PW engines. It can carry 165 passengers. Swiftair took ownership of the plane on Oct. 24, 2012, after it spent nearly 10 months unused in storage, according to Flightglobal’s Ascend Online Fleets, which sells and tracks information about aircraft. It has more than 37,800 hours of flight time and has made more than 32,100 takeoffs and landings. The plane has had several owners over the years, including Avianca and Austral Lineas Aereas. If confirmed as a crash, this would be the fifth one — and the second with fatalities — for Swiftair since its founding in 1986, according to the Flight Safety Foundation. The only other fatal crash for the airline came on July 28, 1998, when the two pilots died on a cargo flight to Barcelona. Algerian aircraft were also overflying the region around Gao to try to locate wreckage, said Houaoui Zoheir, spokesman for the Algerian crisis center. He provided no details on the type or number of aircraft. The passengers include 51 French, 27 Burkina Faso nationals, eight Lebanese, six Algerians, five Canadians, four Germans, two Luxemburg nationals, one Swiss, one Belgium, one Egyptian, one Ukrainian, one Nigerian, one Cameroonian and one Malian, Ouedraogo said. The six crew members are Spanish, according to the Spanish pilots’ union. The MD-83 is part of a series of jets built since the early 1980s by McDonnell Douglas, a U.S. plane maker now owned by Boeing Co. The MD-80s are single-aisle planes that were a workhorse of the airline industry for short and medium-range flights for nearly two decades. As jet fuel prices spiked in recent years, airlines have rapidly being replacing the jets with newer, fuel-efficient models such as Boeing 737s and Airbus A320s. There are 496 other MD-80s being flown by airlines around the world, according to Ascend.